Imaging is central to the evaluation of injured children following abdominal trauma, and computed tomography (CT) is the imaging method of choice to evaluate hemodynamically stable children sustaining significant blunt abdominal trauma. Current generation multidetector CT systems provide high image quality, owing to thinner collimation, reduced partial volume and motion artifacts, and the ability to perform multiplanar reformatted images. CT allows for the accurate detection and quantification of injury to solid and hollow viscera. CT also detects and quantifies intraperitoneal and extraperitoneal fluid and blood. CT can help prioritize optimal management by diagnosing life-threatening injury and active hemorrhage. Additionally, CT demonstrates associated bony injury to the ribs, spine, and pelvis. A normal CT also serves an important function in patient management by excluding potential intra-abdominal or pelvic sources of blood loss. The liver is either the most commonly injured or second-most commonly injured solid viscera. Hepatic injury is believed responsible for the most fatalities in which abdominal trauma is the primary cause of death. Most hepatic injury occurs in the posterior segment of the right lobe.1 The effects of blunt force are maximized in this location because the posterior right lobe is fixated by the coronary ligaments, which limit its movement while the rest of the liver is free to move. Hepatic lacerations may be simple or stellate (Figure 1). Stellate or complex lacerations have a branching pattern. They may be associated with parenchymal or subcapsular hematoma. Hepatic injury is associated with hemoperitoneum in approximately two-thirds of cases.2-3 Hemoperitoneum associated with hepatic injury principally relates to violation of the liver capsule at the site of injury. Hepatic injury may not be associated with hemoperitoneum if the injury does not extend to the surface of the liver, if the hepatic capsule is not disrupted, or if there is extension to the liver surface in the bare area of the liver, which is devoid of peritoneal reflection.4 Injury extending to the bare area may lead to associated retroperitoneal hemorrhage. The primary grading scale used to quantify hepatic injury was developed by the American Association for the Surgery of Trauma (AAST).5 Attempts to develop CT classification systems have had limited success. The AAST grading scale emphasizes the anatomic extent of the injury, including capsular integrity, extent of subcapsular collection, extent of parenchymal disruption, and state of the vascular pedicle. This grading scale is universally utilized in children and adults. However, in children this scale is not predictive of need for operative management because most hepatic injuries can be successfully managed nonoperatively regardless of severity. In various reports between 1% and 3% of children with hepatic injury required surgical hemostasis.6-7 The primary utility of the AAST grading scale in the pediatric age group is in nonsurgical patient management decisions, including duration and intensity of hospitalization and activity restriction. Pancreatic injury is relatively uncommon in children. Approximately 2⁄3 of injuries occur in the pancreatic body. Direct signs of injury may be difficult to identify, owing to the small size of the gland, the paucity of surrounding fat, and the minimal separation of fracture fragments. Transection results in complete separation of pancreatic fragments (Figure 5). Unless the two edges of a fracture are separated by low-attenuation fluid or hematoma, the diagnosis may be difficult to recognize at CT. 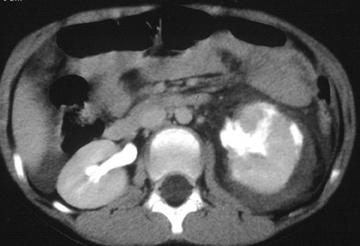 The best indicator of pancreatic injury at CT is unexplained peripancreatic fluid (fluid in the anterior pararenal space or lesser sac) (Figure 6).13-14 This finding may be seen more often than the actual laceration. 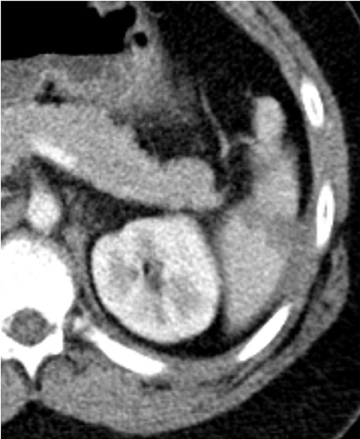 When fluid collects in the anterior pararenal space it may also dissect between the pancreas and splenic vein.14-15 Additional CT signs of pancreatic injury are typically due to associated pancreatitis. These include focal or diffuse gland enlargement, stranding of peripancreatic and/or mesenteric fat, thickening of the anterior renal fascia, and free peritoneal fluid. Identification of pancreatic duct disruption may impact patient management although there are currently divergent opinions regarding the management of ductal injury. The nonoperative management of most pancreatic injury has been proven successful by some, even when there is involvement of the pancreatic duct.16-17 Others feel that a distal pancreatectomy for transection to the left of the spine is the treatment of choice as it is definitive with decreased complications.18-19 Injury to the pancreatic duct can be predicted at CT by evaluating the depth of laceration. More precise assessment of the pancreatic duct is obtained with MRCP. A unique contribution of CT to the evaluation of abdominal trauma is the ability to identify an active hemorrhage. The diagnosis of an active hemorrhage at CT is predicated on the identification of a contrast “blush” or a high-attenuation jet after IV contrast enhancement (Figure 7).20-21 An active hemorrhage results in attenuation values of > 90 HU. The attenuation of extravasated contrast is usually similar to that seen in adjacent blood vessels. The rate of active bleeding required for detection at CT is unclear. Although identifying an active hemorrhage during a CT scan denotes ongoing bleeding at the examination, it does not predict continued bleeding, and most children with an active hemorrhage detected during a CT scan do not require operative intervention. This is particularly the case when the active hemorrhage is contained within a solid viscus and thus surrounded by organ parenchyma, which can tamponade the site of bleeding. In various reports, 20% or fewer of children with hepatic or splenic injury and an active hemorrhage required operative hemostasis.22-25 However, it is imperative that these children—particularly younger children, who have a smaller circulating blood volume—be closely monitored. Intramural hematoma results from hemorrhage into the bowel wall following a partial-thickness tear. The most common location is the duodenum. The injury can usually be managed nonoperatively. Large hematomas can result in a proximal small-bowel obstruction. 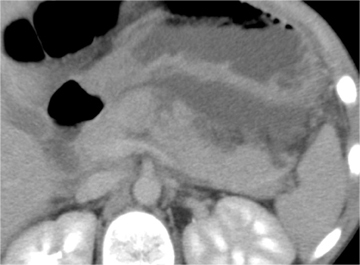 The CT appearance is that of focal bowel-wall thickening that is often eccentric. No extraluminal air or extravasated contrast material should be present. Sonography has largely replaced peritoneal lavage in the assessment of unstable patients following blunt abdominal trauma since it can be rapidly performed at the bedside. Sonography has been primarily utilized to detect free fluid indicative of hemoperitoneum. However, hemoperitoneum in the hemodynamically stable child typically has limited impact on management decisions. Sonography has important limitations in the evaluation of the abdomen in injured children. First, it does not provide any diagnostic information regarding injury to the bony pelvis or lumbar spine. Additionally, sonography cannot be used in the diagnosis of hollow viscus injury. Finally, sonography has been shown to miss approximately 1⁄4 to 1⁄3 of solid viscus injuries.34-35 Therefore, sonography has a limited role in assessing hemodynamically stable children following blunt abdominal trauma. The role of CT in evaluating injured children includes establishing the presence or absence of visceral and bony injury, identifying injury requiring close monitoring and operative intervention, detecting active hemorrhage and estimating associated blood loss. The use of CT as the primary screening modality in the assessment of injured children, along with improvements in supportive care, has played a critical role in the success of nonoperative management of solid viscus injuries. The rapid evaluation of injured children with CT has also resulted in improved triage and has contributed to reduced morbidity and mortality. The decision for operative intervention in the small percentage of children who require surgical hemostasis is primarily made based on clinical criteria, not CT findings.7 Therefore, CT primarily guides nonoperative decisions, such as duration of hospitalization, intensity of care, and length of activity restriction. It has been shown that solid viscus injury grading at CT is useful for estimating the time course of healing.36-40 However, follow-up imaging of solid viscus injury is not indicated in asymptomatic children for several reasons. First, no injury progression or complication is noted in most cases of solid viscus injury. Second, clinical management is rarely altered based on follow-up imaging. Today, CT is the exam of choice in the imaging evaluation of children following abdominal trauma. CT is highly accurate in detecting and quantifying solid and hollow viscus injuries. Sonography has a limited role in the pediatric population for this clinical application, being used primarily to detect free fluid in the unstable child. In addition, CT can help prioritize optimal management by diagnosing life-threatening injury and active hemorrhage. CT primarily guides nonoperative decision making, such as intensity of care and duration of hospitalization. Stalker HP, Kaufman RA. Towbin R. Patterns of liver injury in childhood: CT analysis. AJR Am J Roentgenol. 1986;147:1199-1205. Sivit CJ, Taylor GA, Bulas DI, et al. Blunt trauma in children: Significance of peritoneal fluid. Radiology. 1991;178:185-188. Taylor GA, Sivit CJ. Posttraumatic peritoneal fluid: Is it a reliable indicator of intraabdominal injury in children? J Pediatr Surg. 1995;30:1644-1648. Patten RM, Spear RP, Vincent LM, et al. 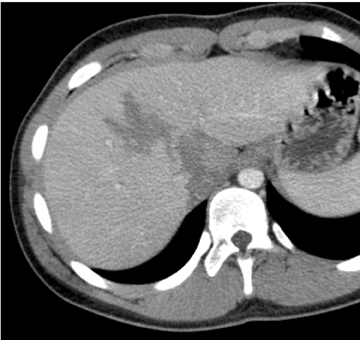 Traumatic laceration of the liver limited to the bare area: CT findings in 25 patients. AJR Am J Roentgenol. 1993;160:1019-1022. Moore EE, Cogbill TH, Jurkovitch J, et al. Organ injury scaling. spleen and liver (1994 revision). J Trauma. 1995;38:323-324. Stylianos S. Outcomes from pediatric solid organ injury: Role of standardized care guidelines. Curr Opin Pediatr. 2005;17:402-406. Ruess L, Sivit CJ, Eichelberger MR, et al: Blunt abdominal trauma in children: Impact of CT on operative and nonoperative management. AJR Am J Roentgenol.1997;169:1011-1014. Harris AC, Zwirewich CV, Lyburn ID, et al. CT findings in blunt renal trauma. Radiographics. 2001;21:S201-S214. Salem HK, Morsi HA, Zakario A. Management of high-grade renal injuries in children after blunt abdominal trauma: Experience of 40 cases. J Pediatr Urol. 2007;3:222-229. Kawahma A, Sandler CM, Carl FM, et al. Imaging of renal trauma: A comprehensive review. Radiographics. 2001;21:557-574. 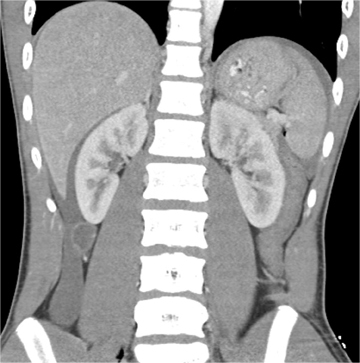 Lewis DR, Mirvis SE, Shanmuganathan K. Segmental renal infarction after blunt abdominal trauma: Clinical significance and appropriate management. Emerg Radiol. 1996;3:236-240. Carroll PR, McAninch JW, Klosterman P, Greenblatt M. Renovascular trauma: risk assessment, surgical management and outcome. J Trauma. 1990;30:547-552. Sivit CJ, Eichelberger MR, Taylor GA, et al. 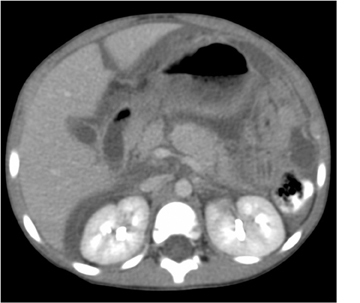 Blunt pancreatic trauma in children: CT diagnosis. AJR Am J Roentgenol. 1992;158:1097-1100. Sivit CJ, Eichelberger MR. CT diagnosis of pancreatic injury in children: Significance of fluid separating the splenic vein and pancreas. AJR Am J Roentgenol. 1995;165:921-924. Lane MJ, Mindelzun RE, Sandhu JS, et al. 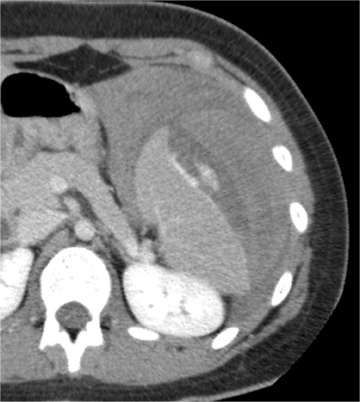 CT diagnosis of blunt pancreatic trauma: importance of detecting fluid between the pancreas and the splenic vein. AJR Am J Roentgenol. 1994;163:833-835. Wales PW, Shuckett B, Kim PC. Long-term outcome after nonoperative management of complete traumatic pancreatic transaction in children. J Pediatr Surg. 2001;36:823-827. Cigdem MK, Senturk S, Onen A, et al. Nonoperative management of pancreatic injuries in pediatric patients. Surg Today. 2011;41:655-659. Canty TG, Weinman D. Management of major pancreatic duct injuries in children. J Trauma. 2001;50:1001-1007. Wood JH, Patrick DA, Bruny JL, et al. Operative vs nonoperative management of blunt pancreatic trauma in children. J Pediatr Surg. 2010;45:401-406. Sivit CJ, Peclet MH, Taylor GA. Life-threatening intraperitoneal bleeding: Demonstration with CT. Radiology. 1989;171:430. Taylor GA, Kaufman RA, Sivit CJ. Active hemorrhage in children after thoracoabdominal trauma: Clinical and CT features. AJR Am J Roentgenol. 1994;162:401-404. Cloutier DR, Baird TB, Gormley P, et al. Pediatric splenic injuries with a contrast blush: Successful nonoperative management without angiography and embolization. J Pediatr Surg 2004;39:969-971. Lutz N, Mahboubi S, Nance ML, Stafford PW. The significance of contrast blush on computed tomography in children with splenic injuries. J Pediatr Surg. 2004;39:491-494. Nwomeh BC, Nadler EP, Meza MP, et al. Contrast extravasation predicts the need for operative intervention in children with blunt splenic trauma. J Trauma. 2004;56:537-541. Davies DA, Ein SH, Pearl R, et al. What is the significance of contrast “blush” in pediatric blunt splenic trauma? J Pediatr Surg 2010;45:916-920. Sivit CJ, Taylor GA, Newman KD, et al. Safety-belt injuries in children with lap-belt ecchymosis: CT findings in 61 patients. AJR Am J Roentgenol. 1991;157:111-114. Sivit CJ, Eichelberger MR, Taylor GA. CT in children with rupture of the bowel caused by blunt trauma: Diagnostic efficacy and comparison with hypoperfusion complex. AJR Am J Roentgenol. 1994;163:1195-1198. Strouse PJ, Bradley JC, Marshall KW, Cywes R. CT of bowel and mesenteric trauma in children. Radiographics. 1999;19:1237-1250. Jamieson DH, Babyn PS, Pearl R. Imaging gastrointestinal perforation in pediatric blunt abdominal trauma. Pediatr Radiol. 1996;26:188-194. Sivit CJ, Cutting JP, Eichelberger MR. CT diagnosis and localization of rupture of the bladder in children with blunt abdominal trauma: Significance of contrast material in the pelvis. AJR Am J Roentgenol. 1995;164:1243-1246. Vaccaro JP, Brody JM. 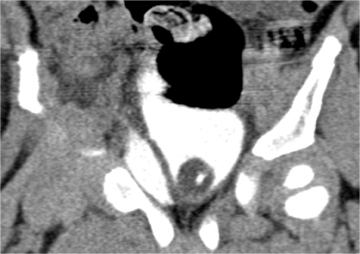 CT cystography in the evaluation of major bladder trauma. Radiographics. 2000;20:1373-1381. Chan DP, Abujudeh HH, Cushing GL, Novelline RA. CT cystography with multiplanar reformation for suspected bladder rupture: experience in 234 cases. AJR Am J Roentgenol. 2006;187:1296-1302. Morgan DE, Nallamala LK, Kenny PJ, et al. CT cystography: Radiographic and clinical predictors of bladder rupture. AJR Am J Roentgenol. 2000;174:89-95. Poletti PA, Kinkel K, Vermeulen B, et al. Blunt abdominal trauma: Should US be used to detect both free fluid and organ injuries? Radiology. 2003;227:97-103. Richards JR, Knopf NA, Wong L, McGahan JP. Blunt abdominal trauma in children: Evaluation at emergency US. Radiology. 2002;222:749-754. Bulas DI, Eichelberger MR, Sivit CJ, et al. 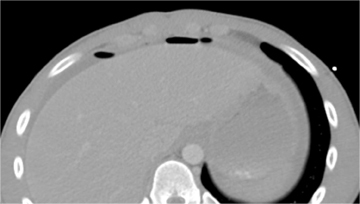 Hepatic injury from blunt trauma in children: Follow-up examination with CT. AJR Am J Roentgenol. 1993;160:347-351. Benya EC, Bulas DI, Eichelberger MR, Sivit CJ. 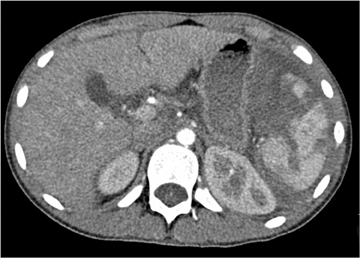 Splenic injury from blunt abdominal trauma in children: Follow-up examination with CT. Radiology. 1995;195:685-688. Huebner S, Reed M. Analysis of the value of imaging as part of the follow-up of splenic injury in children. Pediatr Radiol. 2001;31:847-855. Yale-Loehr AJ, Kramer SS, Quinlan DM, et al. CT of severe renal trauma in children: Evaluation and course of healing with conservative therapy. AJR Am J Roentgenol. 1989;152:109-113. Abdalati H, Bulas DI, Sivit CJ. Blunt renal trauma in children: Healing of renal injuries and recommendations for imaging follow-up. Pediatr Radiol. 1994;24:573-576. Livingston DH, Lavery RF, Passannante MR, et al. Admission or observation is not necessary after a negative abdominal computed tomographic scan in patients with suspected blunt abdominal trauma: Results of a prospective, multi-institutional trial. J Trauma. 2008;44:273-280. Hom J. The risk of intra-abdominal injuries in pediatric patients with stable blunt abdominal trauma and negative abdominal computed tomography. Acad Emerg Med. 2010;17:469-475. Pediatric abdominal trauma imaging: Imaging choices and appropriateness. Appl Radiol. Dr. Sivit is in the Department of Radiology, University Hospitals Case Medical Center, Cleveland, OH.